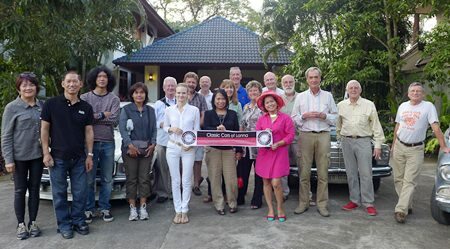 Members of the Classic Cars of Lanna Club held a Mystery Tour on Sunday, January 26, 2014. 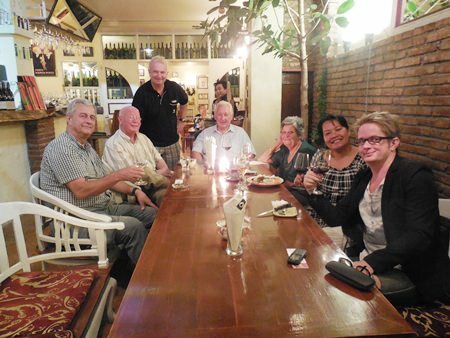 Starting out from Nim City Daily, the group left at 10:30 a.m. to drive out to San Kamphaeng Hot Springs with stops along the way. Members took part in a quiz and the person with the most correct answers was awarded a bottle of wine at the party that concluded at Neil’s house. Pakin Ploypicha and Toby Allen join their friend Nutyapron Aomaree at the new Aji restaurant at the Rimping Supermarket in the Maya Lifestyle Shopping Center on Thursday, January 23, 2014. 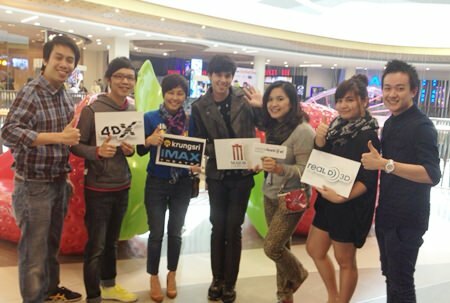 Central Festival Chiang Mai and the Major Cineplex Cinema hosted a private party for fans who will join the meet and greet event with the hottest young celebrities in Thailand with Pachara Chirathiwat. The fans ate at the Sizzler Restaurant in Central Festival Chiang Mai in preparation for the Private Fans Meet & Star Road Show that will be held on February15, 2014. 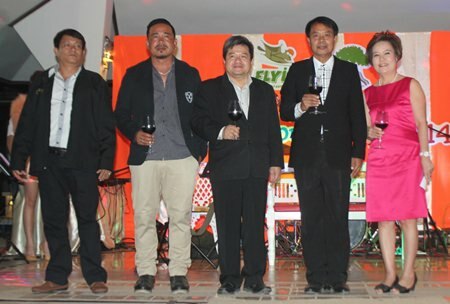 The Flying Squirrels Ziplining Adventure Tour celebrated their 1st anniversary on January 26, 2014 at a party held at Green Lake Resort Chiang Mai at 6:30 p.m. The Flying Squirrels invited staff, agencies and media to the party. Flying Squirrels offers zipline high in the treetops of the forest in Pong Krai in Mae Rim at 1000 m above sea level. Set at the highest international safety standards an average tour takes 3 hours visiting 26 stations. The Chiang Mai Night Safari invited tourists to take their photos with 3 horses as part of an old Chinese belief that it will achieve unity and also pray for good fortune in the Chinese New Year. 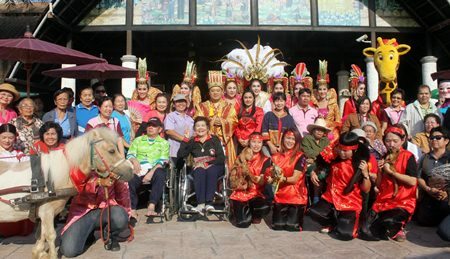 Dr. Sarawut Srisakun, Director of the Night Safari, invited local Chinese –Thai residents and tourists to ride horses as they are a symbol strength, agility, rapid advancement in work and good health. The Night Safari also held special performances for tourists. 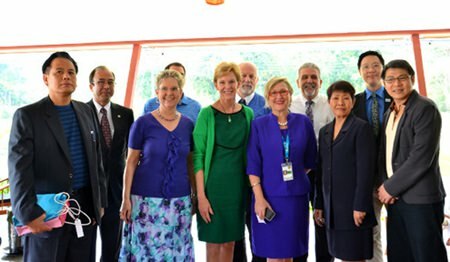 Head of Prem Tinsulonanda International School, Maxine Driscoll, was honored to welcome the U.S. 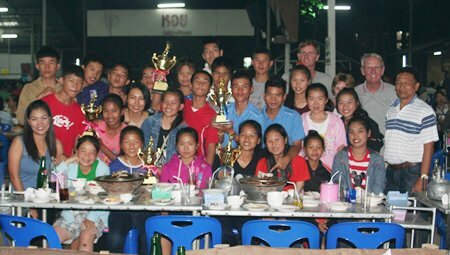 Ambassador to Thailand, Ms. Kristie Kenney and Mr. Michael Heath, the Chiang Mai U.S. Consul General along with Heads of Schools and Principals from Chiang Mai’s leading High Schools to The Krapood Kitchen in Mae Rim recently. Ms. Kenney was very interested to learn about high quality education in Chiang Mai and how American Universities can attract Chiang Mai students to study in the USA. Ace! The Academy for EducationUSA sponsored the luncheon.